The Rhode Island Department of Transportation will conduct a detailed safety analysis of all 200 intersections where bike paths cross roads, the director of the state agency said Wednesday. 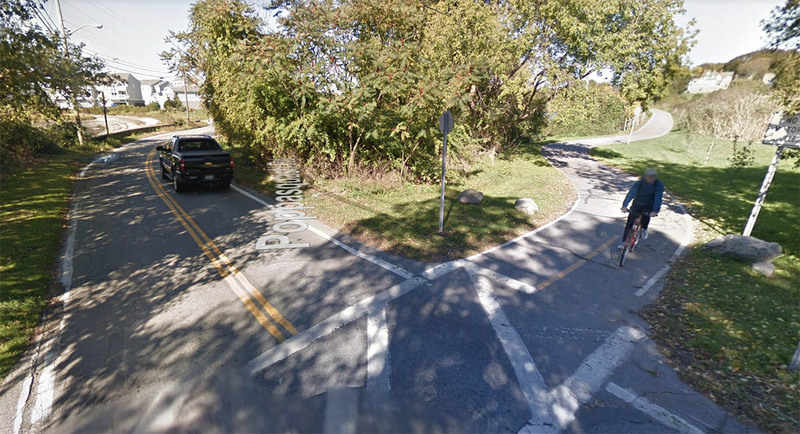 The study comes in the wake of the death of a young cyclist, who was struck by an automobile Tuesday at the intersection of the East Bay Bike Path in Bristol and Poppasquash Road. As I suggested on Twitter, bike path crossings like this one in Bristol should be raised, forcing motorists to slow as they approach them. visibility at crossings in numerous locations is very poor here and at other EBBP crossings, for both riders and drivers. one unfortunate issue here as well is that riders are diverted into Rt. 114 when the path has been closed due to construction and after this tragedy. these detours have not been accompanied by any protections for riders or marked detours, which is dangerous and ignores the needs of riders.